Glassine envelopes labelled "Pray For Death." 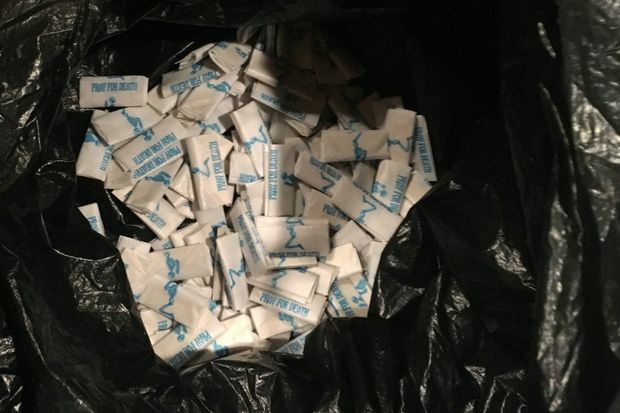 THE BRONX — A drug-dealing ring near Fordham University advertised its product as "Pray for Death" heroin but sold deadly fentanyl and fentanyl mixtures instead that led to at least one overdose, authorities said Thursday. A six-month investigation, which began in April using wiretaps, undercover officers and surveillance cameras, caught seven men operating an "open-air market" on Marion Avenue and 194th Street, in Fordham Manor, according to Bridget Brennan, Special Narcotics Prosecutor. The drug hot spot falls within the 52nd Precinct, which is home to some of the highest overdose rates in the city, Brennan's office said. The indictment includes a charge related to a Sept. 13 overdose, which was caught on camera. One accused dealer, 35-year-old Stanley Sacarillo, also known as "Twin," sold to a user who, sitting in front of a gated parking lot, began to overdose after snorting a second package of drugs. Sacarillo checked for a pulse, called 911, and carried the person around the corner, according to authorities. The victim was revived after an ambulance arrived, but Sacarillo was charged with reckless endangerment, among other crimes. Sacarillo made more than a dozen sales to undercover polices, according to the indictment. The largest, of 300 bags for $2,850, came just three days after his customer overdosed. Bronx District Attorney Darcel Clark called the video of the man overdosing "a chilling testament to the ferocity of fentanyl." A search of the home of 39-year-old Billy Perez, also known as "Blast," yielded $200,000 in cash, and drugs including envelopes stamped with the words "Pray for Death" and an image of a skeleton kneeling, according to prosecutors. The same bags were found at the home of 61-year-old Hector Figueroa, one of the arrested men, who lived around the corner from the drug spot, authorities said. Fentanyl is 50 to 100 times more powerful than morphine, according to the city's Department of Mental Health and Hygiene. The drug was responsible for approximately half of overdose deaths in New York City in 2016, up from fewer than 5 percent the previous year, according to the agency. The 48-count indictment, for seven defendants, stemmed from 15 drug deals to undercover officers for a total of almost $10,000, according to the Office of the Special Narcotics Prosecutor For The City of New York. The indictment against the seven men include conspiracy, drug and weapons charges. Information on the accused inviduals' lawyers was not immediately available.